Members of the Gallia Academy volleyball team pose for a picture following the season finale on Monday. Standing from left to right are Maddy Petro, Hunter Copley, Arianna Jordan, Alex Barnes, Ryelee Sipple, Katie Carpenter, Aubrey Unroe, Peri Martin, Grace Martin, Ashton Webb, Taylor Burnette, Megan Bailey and Maddie Wright. CENTENARY, Ohio — A perfect end to another perfect league campaign. 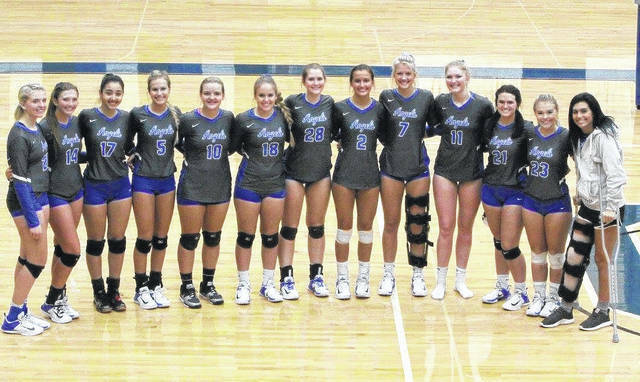 The Gallia Academy volleyball team wrapped up its second consecutive unbeaten Ohio Valley Conference season on Monday night in Gallia County, never trailing in a straight games win over visiting Chesapeake. Gallia Academy (21-1, 14-0 OVC) — which has won 29 league matches in a row dating back to 2015 — boasted a side-out percentage of 76.9 on its way to a 25-12 victory in the opening game. In Game 2, the Blue Angels had their lowest side-out percentage of the night, at 61.1, but still only fought through one tie en route to a 25-18 win. GAHS led wire-to-wire in the finale, posting a side-out percentage of 81.3 on its way to the match-sealing 25-15 victory. For the match, Gallia Academy had a side-out percentage of 72.3, winning 34 of its 47 serve receive chances. Meanwhile, CHS had a side-out percentage of 43.8. GAHS finished with 42 digs as a team and earned a serve percentage of 87.7. The Blue Angels had nine serving errors and 19 hitting errors in the win. Gallia Academy’s service attack was led by Taylor Burnette with 14 points, including one ace. Hunter Copley was next with 11 points and one ace, while Ashton Webb and Peri Martin had five points apiece, with three aces and two ace respectively. Alex Barnes had four points on four aces, while GAHS senior Grace Martin finished with two service points in her senior night game. Webb led GAHS at the net with 16 kills and five blocks. Barnes marked seven kills and two blocks in the victory, while Peri Martin earned four kills, four blocks and a team-best 25 assists. Copley, Ryelee Sipple, Katie Carpenter and Aubrey Unroe each had one kill for the victors, with Copley earning a team-high 14 digs. For Chesapeake, Sydney Wellman recorded four service points, while Rachel Pratt and Brooke Webb added three each. Karli Davis and Corinne Ferguson both had one service point to round out the CHS total. Gallia Academy also claimed a straight games win over the Lady Panthers on Sept. 14, in Chesapeake. The Blue Angels return to action in the Division II sectional semifinal, in which they will host Vinton County on Wednesday. Gallia Academy — ranked 17th in the final OHSVCA Division II Coaches Poll — has won six league titles in the last five seasons, including three straight in the OVC. In their three seasons in the conference, the Blue Angels’ only OVC setback remains a five-game loss at Portsmouth on Oct. 12, 2015.